60 Days of Self Healing is a Divine healing process created & facilitated by Rekhit Kajara Nebthet who has been doing healing work for over 15 years. It will guide you in a series of exercises to assist you in releasing past life karma, ancestral karma, childhood issues, relationship issues, dis-eases and more. We will use the power of focus, prayer, breathing techniques, Ra Sekhi Healing practices, ancestral rituals and much more to bring balance to your mind, body and spirit. We will clear your aura, balance and activate you chakras during this 60 days which will enhance your creativity, sensitivity and intuition. This course is for those who are ready to commit and are sick and tired of being sick and tired. Each exercise you are asked to do will take you closer to your healing. We will have weekly video/phone conferences. There will be videos, emails and affirmations. There will be times where you will be asked to fast from food, TV, social media, etc. There will be times you will be asked to wear certain colors or work with certain crystals or oils. Again each piece is a part of you healing process overall. The more you do the more you will benefit. Some of the benefits your will receive are listed below. Personal Consultations to determine your current state of health (mind, body, spirit). We will find what your particular needs and health goals are and set an action plan to assist you in achieving these goals. Ancestral Readings help you look into the ancestral realm to understand the impact of your most prominent ancestors in your life. Walk away knowing what they are requiring of you to move forward. Support emails and videos will be sent every other day with detox info, recipes, encouragement, healthy tips, exercises and more. 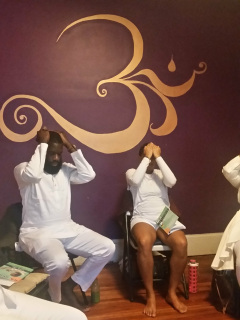 We will also include instructions for full moon, new moon, ancestral and other spiritual rituals that you can complete to enhance your spiritual connection and intuition. When you register you will receive an email with instructions on how to begin. Register now to begin the journey.